Only mutual communication can forge an alliance with the planet's sentient species and prove that humans are more than tools. SUE BURKE spent many years working as a reporter and editor for a variety of newspapers and magazines. She is a Clarion workshop alumnus, and she has published more than 30 short stories. Burke also worked extensively as a literary translator, and while living in Madrid, Spain, she headed the long-running Madrid Writer’s Critique Group. Her translations include the fantasy novel Prodigies by Angélica Gorodischer, the bilingual science fiction anthology Castles in Spain / Castillos en el aire, and the script for the science fiction movie Mindgate. 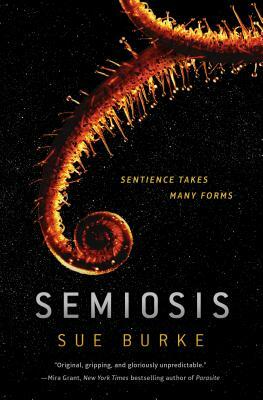 “In Semiosis, Sue Burke blends science with adventure and fascinating characters, as a human colony desperately seeks to join the ecosystem of an alien world.” —David Brin, author of Earth and Existence. “A fantastic SF debut . . . Semiosis will remain relevant for years to come.” —Prof. Daniel Chamovitz, award-winning author of What a Plant Knows and Director of the Manna Center for Plant Biosciences at Tel Aviv University.